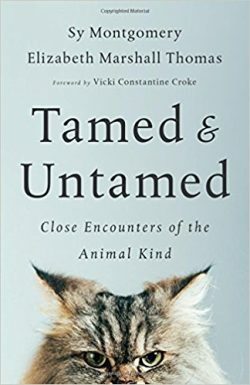 Celebrated author Sy Montgomery talks with us about the essays she and Elizabeth Marshall Thomas have written and collected in a wonderful new book, Tamed and Untamed: Close Encounters of the Animal Kind. Then we hear part of our 2011 interview with Elizabeth Tova Bailey about her book The Sound of A Wild Snail Eating. Did you know that many animals have names for the humans they know? Or that some laugh? Some of them even rock out to our music, like Snowball the parrot (below.) Some lions settle down to watch the sunset every night and roar when it dips below the horizon. These and many other examples in the new book Tamed and Untamed by Sy Montgomery and Elizabeth Marshall Thomas show the depth of animal thought and feeling. Actually, we should say “the other animals” because of course we are animals, too. And this is exactly what Montgomery and Thomas point out in their essays gathered for the book. Drawing on stories of animals both wild and domestic, as diverse as snails, house cats, hawks, sharks, dogs, lions, and octopuses, the book shows that the more we learn about what other animals think and do, the more we understand ourselves as animals, too. Sy Montgomery is the author of many books for adults and children, including The Soul of an Octopus and The Good Good Pig. Her co-author Elizabeth Marshall Thomas is one of the most widely read authors on anthropology and animals wild and domestic. Her many books include Dreaming of Lions and The Hidden Life of Dogs. One of Sy Montgomery’s favorite books about animals is Elizabeth Tova Bailey’s book The Sound of A Wild Snail Eating. We spoke with Bailey back in 2011 about that book and air an excerpt from that interview.